We specialize in new lawns using sod. Are you finishing off the landscaping for a new home in the Indianapolis area? Maybe you have an old lawn that needs to be renovated? Maybe you’re a commercial property owner and you just need your lawn to look the best it can without the long wait for grass seed? For many home and property owners the fastest solution to a beautiful new lawn is usually with the installation of locally grown sod. When installed properly your new sod lawn will be healthy, and green and the best part of it is it’ll only take a few days to install and will look great. Silver Lining Landscaping is a lawn and landscaping company based out of Brownsburg, Indiana and serving the surrounding area. We specialize in the planning, preparation, and installation of new lawns using ready-to-roll-out sod for residential and commercial clients. Whether you need 3000 square feet of new lawn installed on your property or you’d like to rip up and replace an old, patchy and ugly looking, lawn with new sod our team can install a beautiful new lawn for you in just a matter of days. From properly grading your property with loam soil (great for sod), to organizing the installation of irrigation, and finally rolling out the new sod, we’re happy to help. When the ground/soil has been properly prepared and the sod has been rolled out and installed properly your new lawn will carry many benefits. Sod gives you a new lawn in a matter of days not weeks or months. Sod starts your lawn with healthy weed-free beautiful grass. Sod lawns are easier to maintain and keep looking great. “How hard it could it be?” We hear people say. You just roll out the grass and have a new lawn right? Not quite… We’ve installed dozens and dozens of new sod lawns for home and business owners throughout Indiana and the key to a beautiful, healthy long-lasting turf lawn is the care and attention during the prep and installation. We prepare the existing soil and take care of any grading/drainage issues. We can arrange the installation of irrigation and sprinklers at the same time. We roll the turf out ensuring proper seaming and pinning (if necessary) along the way. 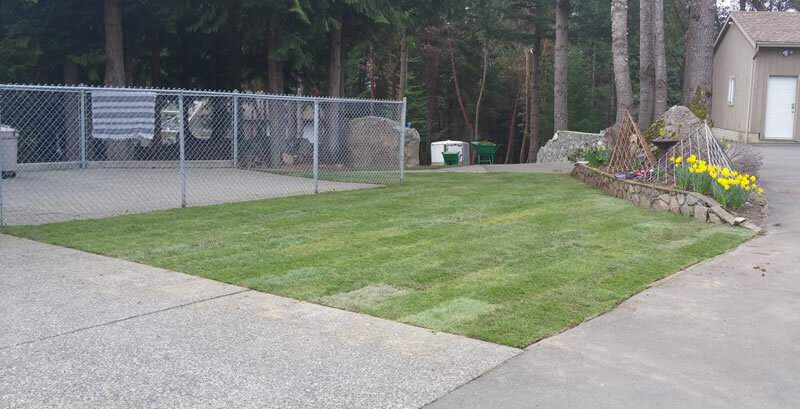 The end result is a beautifully installed, nicely contoured new turf lawn! For most average sized lawns this entire process can be completed in just 1-3 days. For much larger lawns or commercial properties the process could take a little longer but the end result is exactly the same. You’re going to end up with a beautiful, lush green lawn. If you’d like to schedule a consultation with us to discuss the installation of your new lawn using sod we’d be happy to meet with you. Please call (317) 902-5411 or fill out our online form and we’ll get right back to you.